Unlike birds that build their nests in the branches of trees or in thick foliage, some species prefer to nest in hollow cavities. These birds are known as "cavity-nesters." Woodpeckers are primary cavity-nesters as they can excavate their own nest sites in dead trees. 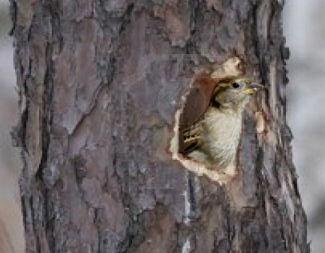 Secondary cavity-nesters like Bluebirds, Chickadees and Titmice lack the jaw and beak strength to do this, so they must rely on old woodpecker holes and naturally occurring cavities to raise their young. Sadly, natural cavities have been in steep decline for many years. Much of the ideal habitat containing dead and dying trees has been replaced by shopping centers, subdivisions and highways. Even in our own backyards, a dead tree is considered unsightly and dangerous and is usually removed. Competition among birds for the remaining nest sites has increased, compounded further by exploding populations of non-native House Sparrows and European Starlings, themselves cavity-nesters. Many native birds are forced to nest in less than ideal cavities, where predators and weather are more likely to take their toll. 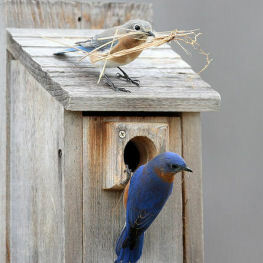 Adding a nestbox to your habitat helps offset these imbalances and increases the breeding success of birds. In addition, a nestbox provides an exciting opportunity to enhance the environment and to observe and enjoy your native cavity-nesting birds. House Sparrows aggressively compete for a dwindling supply of natural cavities. When a pair of nesting birds selects your nestbox, they are trusting their next generation to that cavity. You must therefore assume responsibility to take every step possible to insure their trust is not misplaced. Predators, insects and wet nests are just a few of the potential problems that may arise in a nestbox environment. Periodically checking inside the box, called monitoring, will alert you to these situations and provides you the opportunity to correct or eliminate them. Contrary to popular belief, opening the nestbox will not frighten cavity-nesters into abandoning their nest, nor can they detect your scent. You should, however, refrain from opening the box after the nestlings are 12 days old, as this may cause them to fledge prematurely. And do not "micro-manage" your nestboxes by overmonitoring; once or twice a week is sufficent. If for any reason you are unable to monitor a nestbox, or cannot find someone who can do this for you, it would be best not to put up a nestbox. Strong words? Maybe, but monitoring a nestbox is crucial. 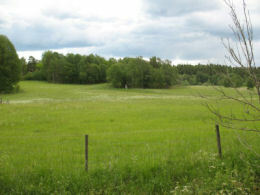 Your property may contain several types of habitat, from open lawn to woodland edge to dense forest. Ideal habitat does not necessarily need to be on your property, but it should be nearby. If your property is unsuitable for cavity-nesters, you might consider placing your box(es) in nearby parks, cemeteries or golf courses. The precise location of the nestbox within a habitat is an important consideration. Trees and their overhanging limbs, fences and other structures can provide platforms from which predators will use to jump to your nestbox. Nestboxes should not be located in or near thick brush or dense shrubs - these are excellent ambush points for predators. Placing a box where it can receive afternoon shade will help the box stay cooler in the hotter months. Nestboxes should be placed with the entry facing away from prevailing winds to minimize windswept rain from entering the nestbox. Compass direction of the nestbox entry will vary depending on your particular location, but westerly directions should be avoided to prevent the hot afternoon sun from shining directly into the entry. A Bluebird pair has selected a nestbox and nest building has begun. 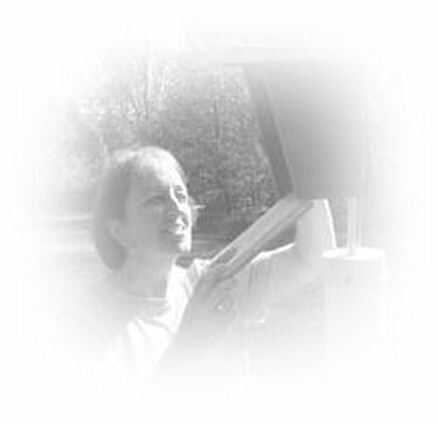 Lead photo: Bet Zimmerman monitoring a nestbox. The photograph was taken by Bet's late husband, Doug. Habitat plays a key role in determining the species of birds attracted to your nestbox.